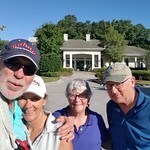 Yesterday we played a round of golf at Stonecrest with Steve and Laura and they left early this morning. 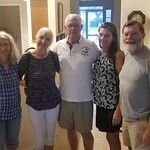 They are headed to Pensacola for some more visiting before heading home to Maine. Had a great Easter. Craig and Janet came up and Connie joined us for Easter dinner. 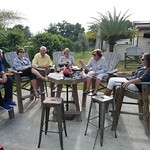 Bob and Cathy came over from Deland this morning and the six of us went over to Fenney Putt'n'Play for 18 holes and then back home for socializing. Deland got pretty complicated for B&C so it was a good chance for them to rest and relax. S&L are staying with us over for the Easter weekend and I set up a tee time at Ocala National for Thursday morning. 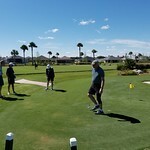 They drove directly over there from Ormond Beach and we had a great round of golf on a beautiful course. 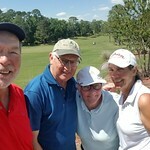 Steve and Laura are in Ormond Beach with her sister Betsey and Steve called for a day of golf. Ed booked a course for us and Steve, Ed, neighbor Mike and I played 18 at Spruce Creek. Last night the Platform tennis Club had its meeting and we had horse racing. Ken Felix, a Prep classmate, who also is Larry Carullo's neighbor in Erie is staying with Larry for a day or two on their way back to Erie. 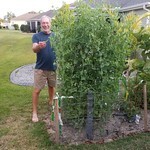 They spent the winter out west near his brother and their son and are making a swing through Florida visiting with friends. 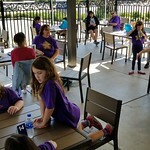 Lynn called the other day to say she and her girl scout troop were coming up from Lakeland to Camp Wildwood (a few miles from us) this weekend. Alesa is back to gardening. 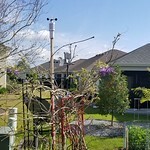 The wisteria is blooming, the peas and tomatoes are doing great, we have about two dozen peaches on our tree and Alesa bought a camelia plant which we planted by the font door. We both still have terrible coughs which continues to affect our sleep. End of February already. Spent the weekend of the 16th and 17th running the Dilly-Dilly tournament for the platform tennis club. Alesa is the VP of the club and since she can't play we were available to help out. Happy Saint Valentine's Day! Last night was the February Erie Club meeting which means Smith's Hot Dogs. 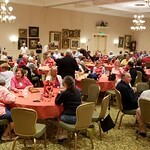 We had a huge crowd and everything went well. 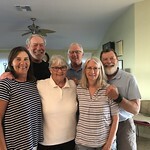 Ann and Ed Dawson were unable to make it because Ann had hurt her back a few days ago and an MRI showed that she had a compression fracture.